Who needs an Oscar trophy when you have Jessica Biel? 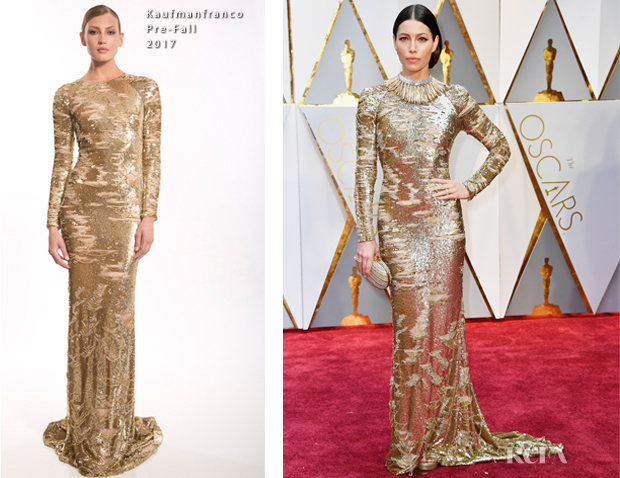 At the 2017 Oscars, held on Sunday (February 26) in Hollywood, California, she was every bit the golden goddess in a statuesque KaufmanFranco Pre-Fall 2017 gold-leaf, body-con gown. Giving all new meaning to 24 karat gold, this sultry, shining look was priceless—and her styling of it only elevated it to another stratosphere. I love how she added the statement collar necklace from Tiffany & Co. You wouldn’t think a dress as sparkling as this would benefit from it, but it really added a fascinating layer of allure. The same could be said for her sculptural hairstyle.